Traditional boiled corned beef brisket served with braised cabbage and fresh vegetables. Fresh local haddock breaded in panko crumbs and served with choice of potato and coleslaw. 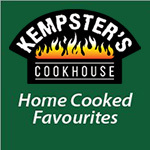 Kempster's Cookhouse is a member of the Grafton Connor Group of companies. All right reserved.